This is not a coup d’etat. It is the execution of the people’s will. 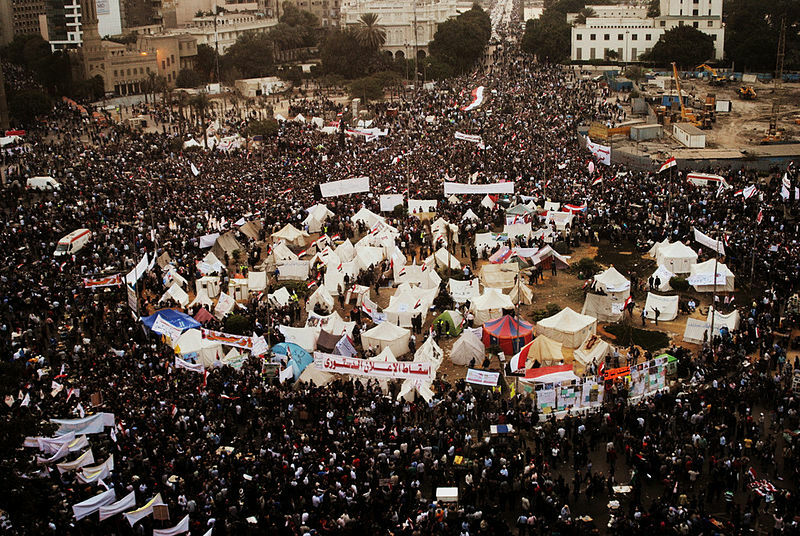 Fifteen million people were on the streets, that’s three times more than in Mubarak’s time. They have been demonstrating in the streets to oppose the Muslim brotherhood. I was one of the people who elected Morsi. I voted for a liberal socialist the first time, but in the second round, it was an old regime general versus Morsi. I didn’t want the old system to come back, so I voted for Morsi. But the past year has been really horrible. Morsi made some constitutional declarations against the judicial system. He withheld the Supreme Court from convening to make a decision about the eligibility of the National Assembly. There were some demonstrations, and police brutality. The Muslim Brotherhood withdrew all agreements with other political parties. They were transferring the whole government system according to their supporters. For example, they appointed a local governor who was a member of the Islamic group that carried out the Luxor massacre in 1997. The people were enraged. They didn’t let him in the governor’s building. They were demonstrating until a few days before 30 June, then he resigned without ever entering the building. Another problem was Morsi’s response to the Ethiopian government official about the Nile dam. He sat on air, threatening Ethiopia. That’s a real problem with national strategy. Morsi has also described other sects in Islam as a word meaning “impure”. It’s a really bad word. We are all Muslims. But the Muslim Brotherhood uses discriminatory terms all the time. This is fascism. That’s why the people revolted. Google’s lowest estimation of the number of people who demonstrated was 14.7 million. Some estimates say it was up to 30 million. That’s in a country of 85-90 million people. If you take out the very old and young, that’s a third to a half of the population out on the streets. I had a quarrel with my nephew last night. He has been in Germany the last two years, and didn’t comprehend how the army could have made a move like this with the support of the people. I have no great sympathy with the army, but they were executing the people’s will. I told him that no fascist rule ever went away with peaceful demonstrations. It always takes force. If we had let them stay three years until the end of Morsi’s term – I think we would have ended up in a cycle like pre-war Germany. He was that bad. The Muslim Brotherhood had a plan for the whole region, not just Egypt. Imagine if Hitler could have been aborted early. That’s what we did. The army has supported the people, and the transformations are according to the constitution. It says that if the president dies or something happens, the presidency temporarily goes to the Supreme Court president. That’s what is happening now. The fanatical Islamists seem enraged, but most of the people are relieved. I’m not rejoicing like the first time, however. I know there is a lot of work to be done. I’m not as naïve as before. I’m feeling serene happiness rather than wild rejoicing like after Mubarak. This has been proof to me on a personal level that the path to democracy is long and laborious. Today, I’m going to work. I’ve been striking and demonstrating all week. But this morning I’m back to work at the National Research Center. I’m a full professor there, peer reviewing grant applications. I hate politics! I’m a scientist. The last two and a half years has been a vivid period in my life; a rollercoaster ride. But I’m full of hope. We are going to have early elections. The demonstrations on 30 June were asking for that. But ultimately we don’t want a system relying on this or that person. Egypt has been swaying back and forth from one leader to another – from Nasser to Sadat to Mubarak to Morsi. We need to start building institutions. We need strong institutions that can lay the foundation of a democratic, friendly Egypt. Thanks for sharing this, great insight into the events in Egypt.